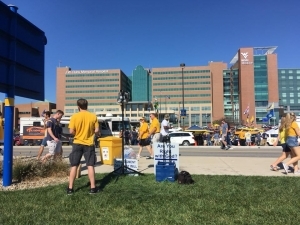 MORGANTOWN, WV – Andy Schmelzer led the AppalachiaCry Ministries team for our first WVU game as part of the Sports Fan Outreach 1,000 (SFOI 1,000) effort. ACM teams up with SFOI in an effort to reach the tens of thousands of college and pro football fans across the country each year. In 2016, Andy and I went it alone. However, by God’s grace it looks like that may change this year. 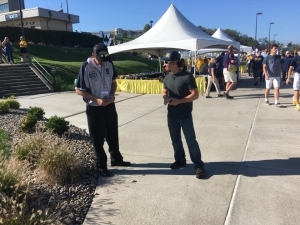 During the ACM Fall College Tour, we met brother Joseph Graves who regularly evangelizes outside the Mountainlair at WVU. After rejoicing in finding one another, we are looking to labor with him and his friends as much as possible, both on campus and at the games. He joined Andy for this game. As they ministered, another brother named Jared who claimed to know me dropped by and handed out tracts with the team for about an hour. While Andy and Joseph took turns preaching, Andrew and Cheyenne handed out tracts. There were a few conversations and the usual drive-by hecklers. A pleasant surprise was the encouragement given by many Christians as they passed by. This went on for a couple hours. Andy did have an extended conversation with a couple Roman Catholics who asked about transubstantiation. Andy spent time in the Scriptures exposing the false teachings of the Roman Catholic church. Though one of the men appeared very intelligent, his thoughts escaped him because of his drunkenness. 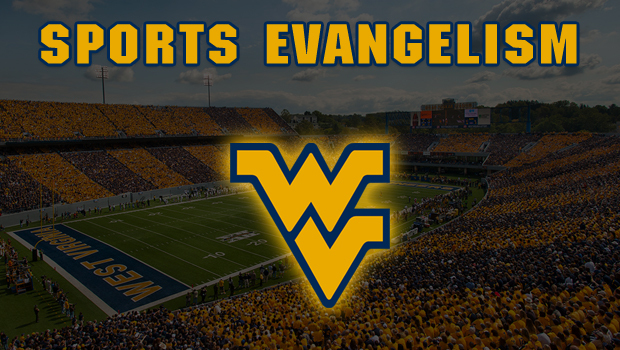 Our next game will be on 10/28 as WVU takes on Oklahoma State University. A big crowd is expected and we’ll have another brother who is learning how to open-air preach with us. God is faithful!